And this is the promise that He has promised us—eternal life. I often think about heaven, don’t you? I think of all the people waiting there for me. At the top of my list are God and Jesus, of course! There is my Daddy, who passed into the arms of Jesus exactly one year ago, and the countless relatives who went before him. Then there are my college cross country coaches and teammates who died in a plane crash. There are our three miscarried babies, Gloria Anne, Angelica May, and Gabriella Hope and our dear grandchild. There are all the Bible heroes like Abraham and Sarah, Joseph, David, Esther, Ruth, Daniel, all the Marys and Martha, Peter, John, Paul…And there are a number of people Facebook still tells me are having birthdays, but they are now with Jesus. It’s comforting to think about all those dear people waiting for me in heaven. One day while reading my Bible and contemplating heaven, I realized there won’t be any shadows in heaven. Isn’t that interesting?! Think about it…we have shadows on earth because a light or the sun shines on one side casting a shadow to the other side. But in heaven, Jesus is the light and He is everywhere! With light coming from all directions, you can’t have shadows! I imagine my Daddy, who studied light as a professor, asking Jesus, “Wow! How do you do that?” God drives out the darkness and there is only light! Isn’t that a comforting thought? …no shadows, no darkness, no sighing, no tears, no death, no sickness, no pain, no evil…only the light of our precious Savior Jesus. Wow! Today’s TEA CUPP: Turn on your light and turn your thoughts heavenward today. Look up the Bible verses in this devotion and underline your favorite verses. Write them in your prayer journal. Thank Jesus for His promise of heaven and imagine what it will be like. Keep shining for Jesus! 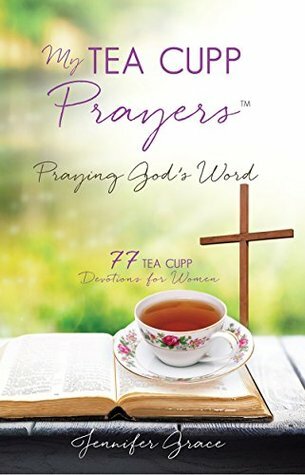 If you enjoyed today’s devotion, you might also like to read My Two Daddies in Heaven, and Leave No Doubt, and Glimpses of Heaven with My TEA CUPP Prayers. Thank you for stopping by My TEA CUPP Prayers! Jesus loves you! You are both in heaven now. My Father who art in heaven, hallowed by Thy Name. You’ve always been there from the beginning of time, creating this world, knitting us together, watching over us, saving us through the precious blood of Your Son Jesus, guiding us with your Holy Spirit, and covering us with Your wing. You gave me the best earthly Daddy and planned that now was a good time to take him to be with You. And, of course, I wrestle with Your plans as Jacob wrestled the Angel so long ago. Did you really need my earthly Daddy right away? Yet I’m so very thankful he is with You! You are both in heaven together, Father God and Daddy Jon. How’s it going up there? I imagine the Creator of the Universe and the professor are having some good scientific discussions. Are there more than seven colors in the rainbow? Are you doing any experiments with quartz crystals and refracted light? Can you look at the stars through a telescope or are they right beside you? Is Father God explaining how He made all this cool stuff out of tiny particles, or does it not really matter anymore? Are you enjoying friends and family, Daddy? I imagine you have no more pain in your hip or knee, and you are so strong, carrying our babies on your shoulders. I’m so thankful you are both together now. Thank you, Father God, for giving me time with my Daddy in his last days here. Of course, I’d still like one more visit, one more chat around the kitchen table, one more hike in the forest, one more story with Grandpa on the sofa, one more chess game with Jacob. But those last days were special when I asked Daddy if he loved You and he squeezed my hand. Oh, Jesus, thank You for letting Him be Yours! Oh, Daddy, I keep thinking you are taking a nap or have run an errand, that soon you will come down the stairs for your 10 O’clock coffee and work on the crossword puzzle. I want to send you an email about everyone who came to see you and how Mommy held up beautifully, but maybe you already know this. Karen was with you every day, researching your condition and talking to nurses. Reid and Scott flew all the way from opposite coasts to be with you, then flew back to their wives, Carmen and Cheryl, who drove with them to your service. George came for the longest time and took care of Mommy and the home-front as you knew he would, and surprised us all by singing “Swing Low” at your burial. All your grandkids came for the service, even Bess made it from Russia and Jacob flew in from Cyprus. And your great-granddaughter Kennedy Grace brought everyone joy with her smiles and running around the sanctuary. Nathan and Jacob shared wonderful memories at your service and Kevin played a moving Pachelbel’s Canon in D and God Rest Ye Merry Gentlemen. Kevin also collaborated with family members to present a Grandpa slide show. Kallie, Emily, Joel, Lennie, Kent, Wendy and Jenny Anne and many friends, neighbors and people from your department also braved the weather to cheer up Mommy and remember you. Father God kept us all well and safe through the worst snow and roads and even when it was zero degrees and the snow was falling at the cemetery, He was there with us. Oh, Jesus, thank You that Daddy was 85 when You took him to heaven, just like Caleb was 85 when he entered the Promised Land. Thank You that Daddy used to play “Them Bones” on the banjo, and now You are breathing new life into his bones. Thank You for preparing this place for Daddy in heaven and now he is there with You. And thank You that goodness and mercy followed Daddy all the days of his life, and now he dwells in Your House forever. I love you both! I miss you, Daddy! Father God, please take good care of Daddy until you call the rest of us home and we have that great big family reunion. It seems that as we get older, we attend more funerals and memorial services for loved ones, friends and acquaintances in our town, some departing too soon. The pastors leading the services always do a beautiful job of sharing memories of the departed and comfort for those left behind. We are especially comforted if we know the person is in heaven with Jesus. I remember when my college cross country team died in a plane crash, I knew my coach was in heaven because of his life. Whenever we came home from meets I was always the last one to be dropped off, giving Coach plenty of time to share his faith. Coach Ron would talk long and serious about things I did not understand, yet I knew they were important. When he wasn’t planning our next big workout, he served at his church. Coach Ron had a dream to start a Christian running camp in northern Wisconsin. Because of his faith and example, I know my coach is with Jesus and will be there when I get there, too. Every once in awhile, though, there is someone who we aren’t sure where she stood in her faith journey. We wonder if he is with Jesus. We pray she is in heaven. We ask God to comfort us and assure us he is with Jesus. But we just aren’t sure. So, I want to encourage you today to LEAVE NO DOUBT when it is your turn to go. Make sure that while you are living, people know you love Jesus. Tell them how you study your Bible and meet https://newhorizonacademy.net/female-viagra/ with Him each day for prayer. Let them see the fruit of your faith in good works. Share how you are looking forward to the day when He comes to take you home. Then, when it is your turn to leave this world, your friends and family will have NO DOUBT that you are now in heaven having TEA with the King of kings!!! Today’s TEA CUPP: Confirm your eternal destination today by praying with Jesus. Invite Jesus into your heart to forgive you and guide your remaining earthly days. Then tell a friend about this heavenly TEA party so she can join you there, too! Two truth snowballs hit me one day. I was planted on the sofa by the window where I always sit for my TEA time with Jesus. That day’s Bible reading took me to Mark 13. As I read this, I glanced out the window at two feet of new March snow. Oh, I was so tired of winter! We had such a hard season already, and now we had more snow. To imagine fleeing tribulation in winter would be awful. Yet persecuted Christians in other countries already endure such tragedy. Jesus doesn’t often tell us specifically what we ought to pray except here, “Pray that Your flight won’t be in winter.” And so, since Jesus told me to, I prayed that I would not be fleeing in winter. I prayed my loved ones and I would all be with Him before any tribulation comes. And Jesus promised me in Revelation 3:20 that He will keep me from that hour of trial. This promise is also for you! 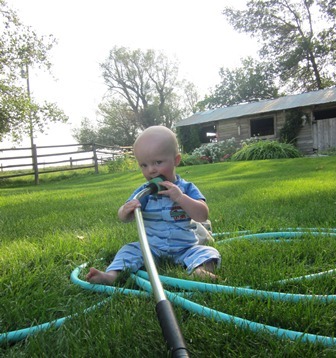 If you haven’t seen a Chinook wind’s work, please see the photos in this devotion. The first is on a Thursday when we received almost two feet of snow. The second is three days later on Sunday when I noticed the Chinook winds starting to eat the snow. The last is on Wednesday just six days after the two feet of snow hit us, not a speck to be seen! Can you imagine that? All of a sudden, Jesus will come like a thief in the night. The heavens and earth will be burned up with a loud noise, and there will be a new heaven and a new earth. It could happen quicker than our snow melted! Today’s TEA CUPP: I encourage you to read Mark 13 and Revelations over the next few days to get a bigger picture of the end times. The battles and judgments are not something we want to endure. Let’s look with joy and hope to Jesus’ promise of taking us to heaven first. If you’re like me, you have a ring of keys…one key for the house, one for the car, one for the post office box, etc. We make sure we have our keys wherever we go, and we get very distressed if we can’t find them! Well, after driving a minivan with oil leaks and miles to indicate driving around the equator 10 times, our family had to look for a different vehicle. My husband found a used minivan one state away. So for Labor Day weekend, we packed up the camping supplies and headed that way to take a look. The car salesman located the vehicle for us and pulled it around so we could test drive it. The van was already running when we climbed in and buckled our seatbelts. So weren’t we surprised when we drove down the road and noticed there was no key! How could it run with no key?! A funny light was also blinking on the dashboard. When we returned to the car shop, the salesman confessed he had forgotten to take the key fob out of his pocket. The light on the dashboard was to warn us not to drive away without the fob. If we had turned off the car, we wouldn’t have been able to turn it on again. This keyless entry is a concept brand new to our old vehicle minds. There have always been keys. It made me wonder how other events would be viewed in a keyless society. Will people think they can get into heaven without the key? If someone else opens heaven’s door, can we just walk in? If our friend has the fob in his pocket, can we get in with her? Oh, my Tea Cupp friend, I want to be sure you have the key to heaven. Jesus is the Key. Jesus is the way, the truth, and the life, and no one comes to the Father except through Him (John 14:6). If you confess with your mouth that Jesus is Lord and believe in your heart that God raised Him from the dead, you will be saved (Romans 10:9). And to all who receive Jesus, to those who believe in His Name, He gives the right to become children of God (John 1:12). Today’s TEA CUPP: If you have the Key to heaven, share it with a friend. If you need the Key to heaven, pray to Jesus right now. Welcome to God’s family! Scripture is taken from the New King James Version®. Copyright © 1982 by Thomas Nelson. You are my Daddy, my brother, my cousin, my aunt, my niece, my landlord, my milkman, my son’s coach, my son’s college roommate, my student, my neighbor, my grocery store checker, my friend’s child, my high school chum, my employer, my friend. You have a reservation in heaven. I made it for you every week in my prayers. Others have been calling in reservations for you, too. To confirm you are on the list in the Lamb’s Book of Life (Revelation 21:27), please accept Jesus (read on). It will be such a great time! The streets are paved with gold in this beautiful city. There is a river flowing from the throne of God and a tree that bears a different fruit every month (Revelation 22:1-2). And we will never have tears again, for there will be no more death or mourning or crying or pain (Revelation 21:4). My dear loved one, I asked Jesus to prepare a place for you, too. My prayer above all other prayers is for you to know Jesus. Why? Because I want you to be in heaven for eternity, not in hell where there really is fire (Revelation 20:15). I want you to enjoy Jesus’ love and forgiveness on earth, and have His forever joy and peace in heaven. I want you to know the One who delivered my soul from death, my eyes from tears, my feet from stumbling, that I may walk before the Lord in the Land of the living (Psalm 116:8-9). So many times I would have lost heart, unless I had believed that I would see the goodness of the Lord in the land of the living (Psalm 27:13). For I know that my Redeemer lives, and He shall stand at last on the earth; and after my skin is destroyed, this I know, that in my flesh I shall see God, Whom I shall see for myself, and my eyes shall behold, and not another. How my heart yearns within me (Job 19:25-27)! Now my citizenship is in heaven, from which we also eagerly wait for the Savior, the Lord Jesus Christ (Philippians 3:20). The neat thing is when you come near to God He will come near to you (James 4:8). I want you to know that through Jesus Christ the forgiveness of sins is proclaimed to you (Acts 13:38). And when you receive Him and believe in His Name, He gives you the right to be children of God (John 1:12). God promises that whoever calls upon the Name of the Lord shall be saved (Acts 2:21). My dear loved one, please ACCEPT JESUS and confirm your reservation today. If you confess with your mouth the Lord Jesus and believe in your heart that God has raised Him from the dead, you will be saved (Romans 10:9). And when that day comes when Jesus calls you home, I know you will go out with joy and be led out with peace; the mountains and the hills shall break forth into singing before you, and all the trees of the field shall clap their hands (Isaiah 55:12). When you reach heaven, you will enter His gates with thanksgiving and His courts with praise (Psalm 100:4) and I will be so thankful to God that you confirmed your reservation. I love you, my dear loved one! And Jesus loves you most of all! God gave me this Bible verse the morning after I finished Don Piper’s book 90 Minutes in Heaven. Somehow I missed reading this book in the decade since it was published, but I’m thankful to finally have been immersed in Pastor Piper’s story. First, he was called to eternal glory in heaven, following a terrible car accident. Second, he was sent back to earth to suffer quite a while! Third, through all his healing and continuing in ministry, God has perfected, established, strengthened and settled Don Piper. To God be the glory forever and ever! This is a true story you won’t want to miss reading. It has also recently been made into a movie, but I vote for the book to avoid the gruesome scenes from the accident and medical world. What impresses this reader most is Pastor Piper’s emphasis on prayer. The book’s dedication to his prayer warriors says, “You prayed. I’m here,” the same four words he spoke his first day back at church. It was the prayers of a passing minister who climbed into his crushed automobile to pray for a dead man that brought him back to earth. It was the prayers of his family, friends, congregation and complete strangers who pulled him through the worst pain and healing of his life. And it is prayer today that helps him continue in ministry, reaching out to others who are hurting. Certainly, this is an inspiration for all to keep praying! Another blessing from 90 Minutes in Heaven are the beautiful descriptions of heaven. These word illustrations cause us to understand why Piper wanted to go back, and burn in us a desire to be there, as well. The first people who greeted him in heaven were his grandfather and a childhood friend who had led him to Jesus. The people kept coming; Piper describes it as “the greatest family reunion of all.” Then there was the music, the singing of thousands and millions of angels, harmonizing both old and new hymns. And just as Piper was enjoying this amazing chorus, he was called back to earth, singing “What a Friend we have in Jesus” with the praying pastor in his mangled vehicle. That’s when they realized he was still alive. Today’s TEA CUPP: If you want a glimpse of heaven and the power of prayer, I highly recommend Don Piper’s book, 90 Minutes in Heaven. If you desire more than a glimpse and want to spend eternity in heaven (Yes, you do! You don’t want the alternative! ), please read these Bible verses and pray to Jesus today. Welcome to heaven, my friend! The Sweet Forever is in my dreams today. So many times in the “U” part of My TEA CUPP Prayers, I focus on Understanding my story in the past. The above verse would take me to a sad time in life, reminding me of when I almost lost heart. One day when reading this passage I realized, I need to focus on seeing the goodness of the Lord in the land of the living! “My Story to Come” is what I must remember. Oh, hallelujah, what a glorious day that will be! At church recently we sang this beautiful old hymn about the land beyond the river. I want to remember this each moment…how I will see my Savior Jesus’ face when I cross the river someday. This is “My Story to Come” that I long for me, for our children, for all my family and friends. Today’s TEA CUPP: My dear TEA CUPP friend, do you think of that day when you will pass from this life into the next one? If you believe in Jesus, you will live eternally with Him in heaven. That is why I spend time each day with Him having TEA, so I can get to know my forever Lord better. Won’t you do the same? Joel loves his bath time. Every night after dinner he points to the bathroom, announcing, “Baaa.” He really needs a bath after wearing his soup bowl or finger-painting with pasta sauce. 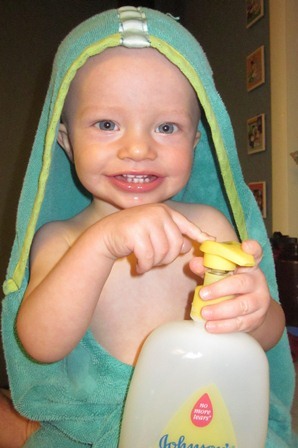 Joel has many favorite toys he plays with in the tub, but lately he has chosen an empty bottle of Johnson’s baby bath. He takes the lid on and off, dumping and pouring water again and again. One evening Joel was studying his empty soap bottle, pointing out the pink tear drop to me. Inside the teardrop is Johnson’s famous promise, “NO MORE TEARS.” We are very thankful for their no tear shampoo. This got me thinking about the One who promises “NO MORE TEARS” for eternity. No tears, sadness or death. Can you imagine? No sin. No people upset. No wrong words or hurt relationships. No abuse or pain or addictions. None of the trials we have in this world. No financial struggles. No cancer. No losing babies. No broken families. NO MORE TEARS! When we take a bath in the Living Water, we are baptized into new life with Christ. We claim NO MORE TEARS for eternity. What a heavenly promise for all to embrace! I look forward to that wonderful day! Thank you, dearest Jesus for Your promise of NO MORE TEARS! Today’s TEA CUPP: Draw a tear-drop shape in your prayer journal today and write the promise from Revelations 21:4. If you are going through a really tough time, perhaps you’d like to post this promise on your bathroom mirror, right near your bottle of shampoo (that’s what I’m going to do today!). Are you going through a hard time? An illness? Family troubles? Job difficulties? You need a spacious place, the prescription that will heal your aching heart. The psalmist shared this cure when he wrote of his affliction and the anguish of his soul. Then he rejoiced that God put his feet in a spacious place. Anguish and affliction describe when we left our camping ministry. It was a rough time, and I was worried where we would live. I shouldn’t have worried, of course, for God prepared for us this spacious place to rent. 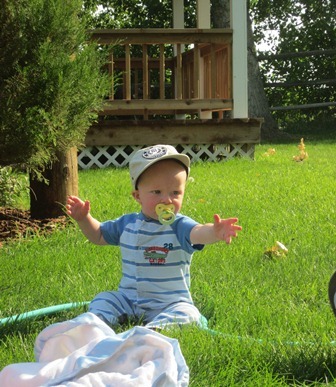 Our yard has lush green grass, even here in the brown state of Montana. Huge old willow and cottonwood trees shade the south side of our house and protect us from winter winds. A lovely English garden is nestled in front of an old dairy barn, surrounded by hay fields and mountains in the distance. Yes, Jesus knew just the place I needed to heal my anguish. Jesus also promises to prepare a place for us in heaven. His promise of a heavenly home keeps me going even on the toughest days. He is arranging for me a glorious, spacious place. God has a spacious place for you, too, my TEA CUPP friend. Its is better than anything we can ask or imagine, a balm to heal our hurting hearts. For today, may that spacious place be at the foot of the Cross. Thank You, dearest Jesus, for a spacious place to heal all our afflictions. Today’s TEA CUPP: I pray God’s spacious place for all on my prayer list.